Any vegetable stuffed with any meat is just delicious isn't it? I'd bet that you could get any meatatarian to try this and love it. That said, I like to make mine with spiced sausage but you can use any ground up meat (i.e. ground beef, ground chicken, ground turkey, etc.). Depending on the meat you use, I'd rate this as a pretty healthy meal...veggies, egg, onion, garlic, lemon! There's the breadcrumbs (I use panko...panko rocks!!!) and cheese that's "less healthy" but better than an oily pizza and this is still damned tasty. The 40 min cook time is a little ridiculous because everything is already cooked except for the zucchini, so in order to cut down the cook time to make this a "quick" meal, preheat the oven as soon as you can, throw on the meat and onions to brown, then start scooping out the zucchini guts. I did this and then threw the entire thing into the oven for 10 min and it was perfect, the zucchini wasn't too soggy and still has some crisp to it. Eating this for leftovers the next day was still so tasty, the zucchini is soggy when you re-heat...but the flavor is so good you don't even notice, sprinkle a little extra lemon juice on the top and you're good to go! Preheat oven to 350 degrees. Drizzle a large baking dish with oil. 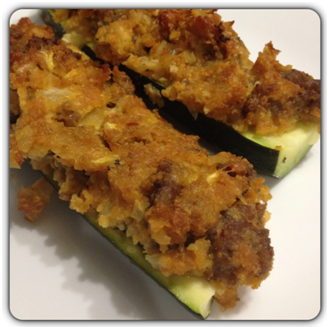 Scrape seeds and soft flesh from zucchini and reserve ½ cup. Place zucchini, cut sides up, in baking dish. Heat oil in a large skillet over medium-high heat, add sausage and onion. Cook, breaking up sausage, until it is brown and onion is softened. Add garlic and reserved zucchini, cook until garlic is fragrant. Remove from heat and stir in remaining ingredients (breadcrumbs, lemon zest, lemon juice, parm cheese, egg, salt). Divide mixture among zucchini. Bake until filling is firm and each zucchini is tender and wrinkled around edges. Approximately 40 minutes. Garnish with parm cheese shavings.